Something about this photo creeps me out...are these guys hands gigantic, or is it just me? Week 3 in the NFL has come and gone, and we're starting to get a better idea of where the power truly lies. There are surprises to be sure...Broncos at 3-0 and Titans at 0-3 jump to mind, but really we're starting to know who is good, and who is not. The teams who are terrible are more clear cut at this point, as the top of the heap is yet to be determined, but that's what makes football so great. And now...the power rankings! 1. Saints – Yes, this is probably too high, but since these are my rankings and I enjoy watching Dr. Drew Brees operate on opposing defenses, I’m going to stick them up here at number one, even if they should probably be slightly lower. 2. Ravens – The defense is not nearly what it was a year ago, but then, the offense is much further along than it was before. The Ravens may have one of the most impressive wins of the season in going into San Diego and taking down the Chargers in Week 2. This team is legit, this team also wears too much purple, but whatcha gonna do?? 3. Giants – They are banged up, and don’t have much in the way of wide receivers, but the Giants are still a team to reckon with. 4. Vikings – The Vikings have done exactly what I expected them to do with their somewhat easy opening schedule. Things start to get tougher as they’ll play the Packers twice, the Steelers and the Ravens in the next stretch of games. How gigantic will those Packer games be as Brett Favre will face the team with whom he should have retired? 5. Jets – In the preseason looking at the Jets, I was less than impressed. However, Mark Sanchez and Rex Ryan have won me over. Sanchez just looks like a quarterback should, and I absolutely love Rex Ryan’s attitude. He is the type of arrogant that can rub off on a team and make they play better than the sum of their parts. The Jets are for real, I say. 6. Colts – The Colts are hitting their stride, and as long as they have Peyton Manning, they’re in the hunt. 7. Patriots – The rumors of the demise of the Patriots have apparently been greatly exaggerated. I was writing tunes for their burial dirge last week, but after the dominating way they took down Atlanta, perhaps they aren’t as done as I had hoped. 9. Chargers – If I am a San Diego fan, I see no reason to panic just yet. The Bolts have played some good ball, and they are only one back of Denver. There is a lot of season left, the Chargers should win the West. 10. Packers – There is no better way to get healthy than a date with the St. Louis Rams, after faltering at home versus the Bengals, the Pack looks to be back on track and I’m sure they won’t need any more motivation to face Favre and the Vikes in Minnesota on Monday Night. That game is going to get some crazy good TV ratings, I’m sure. 11. Eagles – After feasting on the Chiefs, the upcoming schedule does not get a whole lot more difficult. The Eagles have to face the gauntlet of Tampa, Oakland, Washington, from which they should emerge with a 5-1 record. If Donovan McNabb was going to get hurt, this was not the worst time of the season to have to try and get through without him. Kevin Kolb has been solid. Although Michael Vick definitely showed some signs of rust against Kansas City on Sunday, I hope he continues to improve. 12. 49ers – It’s time to acknowledge that the 49ers just might be a good team. If they were able to keep a 39 year old man from completing a 39 yard TD pass at the end of the game on Sunday, San Francisco would be undefeated right now. The best part of this is that with the success of Mike Singletary in a copycat league, perhaps even more owners will start to consider hiring coaches that are not entirely mentally stable. Ah, I love me some Coach Crazy. Singletary is the man. 13. Cowboys – Wade Phillips is a terrible head football coach, right? We can all agree on this? Why is he still employed? Perhaps an even better question would be, how on God’s green earth did he get three chances to be a head coach. The Cowboys are coming to Denver, but they look less than stellar at the moment. I’m not going to guarantee that the Broncos win, but lets just say I won’t be shocked if it happens. 14. Bears – Since both he and I are diabetics, and since he played for my favorite team last season, I think I was blind to it, but Jay Cutler is a giant tool. I’m glad he’s in the league, because he makes it more fun to cheer against the Bears. It’s good to have a villain, and Cutler plays that role spectacularly. I’m not saying he isn’t a good quarterback, he just isn’t very likable. Plus, he looks like a retarded Beatle, which is fun; It’s John, Paul, Ringo, and George…plus Jay who rides on the short bus. 15. Falcons – Boy, if you’d told me before the season that Falcons-49ers in Week 4 would be a huge game, I’d have been skeptical. However…Falcons-49ers this week is a huge game. The Falcons need to get their mojo back after getting musket whipped by the Patriots last weekend, and the Niners need to have their hearts reattached after having them ripped out by Brett Favre on the last play of the game. 16. Bills – The Bills are a bit of a hard luck team. Their city is dying, they are likely going to move to Canada in the next decade, and they always seem to be just short of being a good team. Plus that whole four Super Bowl losses in a row thing in the early Nineties. I see reasons to hope in Buffalo, but I think they don’t quite have enough to compete in the AFC, especially with the Jets and the Pats in their division. 17. Cardinals – If I were a gambling man, I don’t think there is any way in the world I would ever put money on the Cardinals. This is one of the most Jekyll and Hyde teams in the NFL. You never know if you’re going to get pounded by them or beat the living snot out of them. Either option is a possibility each and every week. The Cardinals have zero consistency. 18. Broncos – I want to believe, I really do. The Broncos have been one of the most consistent teams so far this season, Josh McDaniels’ regular season to this point has been as good as his offseason was bad. If he keeps coaching this way, I’ll have to take back all the bad things I said about him in the offseason. The reason I’m holding off on the Orange and Blue Kool-Aid is that they really haven’t beaten anyone yet. The Bengals might be good, but the Broncos win against them was aided by a healthy amount of luck, and the Browns and Raiders are cover your eyes awful right now. In another five weeks we will know a lot more about how much we can trust the Broncos. For now, I’m reserving judgment, and I’m hoping like mad that they are as good as they have looked to this point. 19. Bengals - *Footnote to my Steelers comment…The Bengals might actually be pretty good. They are one ridiculously lucky Denver Broncos pass away from being undefeated. 20. 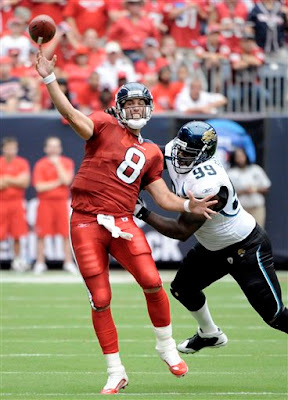 Texans – Matt Schaub is putting up some pretty numbers, but I don’t know if there is enough toughness in this team. The Texans really need to put something together, as they are due to be a decent team, and theoretically they have the talent this year. There is just a certain something missing from them, and I can’t put my finger on what it is. One thing I know for certain is that they need to never wear those all red uniforms ever again. Those are dreadful. 21. Titans – What a weird game this weekend. The Titans were playing the Jets, or was it the Oilers playing the Titans? In an homage to the AFL, the Titans wore Oilers uniforms and the Jets wore Titans uniforms. (The Jets were named the Titans before they were the Jets, and the current day Titans used to be the Oilers.) That is confusing, but it meant that no matter the result, the Titans would win the game. Unfortunately for the Tennessee faithful, it wasn’t the team that will continue to be the Titans, as Tennessee fell to an unthinkable before the season started 0-3. Last year the Titans won their first ten games. This year they have already equaled their loss total from the entire year, and they’ve only played three games. 22. 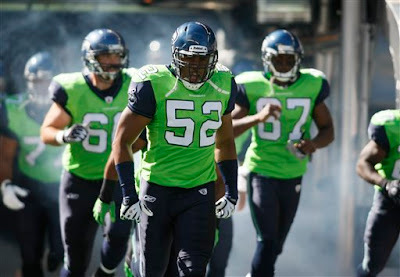 Seahawks – I am convinced that someone in the Seattle organization lost a bet, that is the only possible reason that any NFL team would take the field in a color that is best described as snot green. 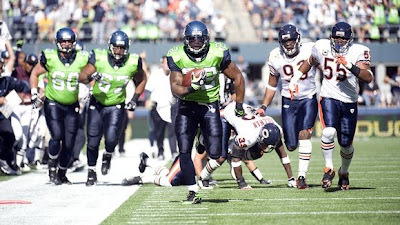 If Dominique Wilkins was the human highlight film, the Seahawks were just human highlighters against the Bears on Sunday. 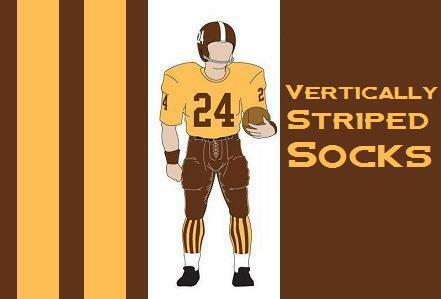 That uniform needs to go away quickly, as it is beyond dreadful…The Hawks as a football team struggle without Matt Hasselbeck, who I am beginning to think faked an injury just so he wouldn’t have to play in those monstrosities. 23. 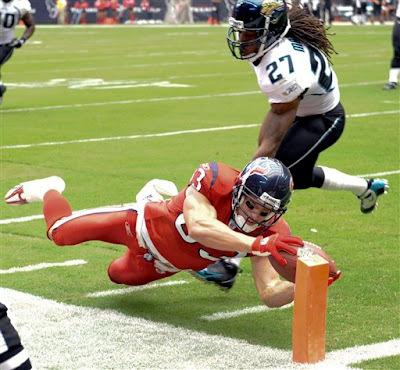 Jaguars – The Jaguars showed some signs of life in beating the cherry red Texans. I’m not expecting that to be a trend, however. 24. Panthers – Jake Delhomme cannot possibly have any confidence left, it’s gone. Completely. There is a very good chance that Steve Smith is going to kill someone on the Panthers sideline this year. Did you see him yelling into the air and to anyone who would listen to him on the sidelines on Monday night? He looked completely homicidal. Jake Delhomme should just demand a trade right now. My favorite part of the Smith rant was after he was done and some sideline lackey carrying some cups of Gatorade almost ran into him, and then bolted out of the way with the fear of God in his eyes. Steve Smith is scary. 25. Dolphins – There is no life or energy in the Dolphins, and now they don’t even have Chad Pennington who is done for the year. It’s going to be a long football season in Miami. 27. 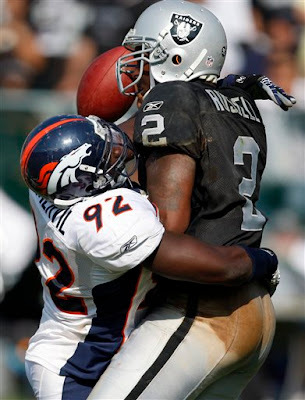 Raiders – I’m not saying that Jamarcus Russell overthrows his targets, but there were Broncos defensive backs calling for fair catches on interceptions on Sunday. 28. Buccaneers – The best thing I can write about the Buccaneers is that they’ve managed to keep their losses to 13 points or less each game. I wish the Broncos played Tampa this year. 29. Lions – Look out for those frisky Lions! Off the schneid after 19 straight losses, that has to feel good if you’re a Detroit fan. I gotta say even I felt pretty good for the Lions, and I’m no friend to Detroit, but there is only so much consistent losing a soul can take…unless you’re a Pirates fan. 30. Chiefs – This AFC West team is dreadful, and the offseason coaching overhaul may have made things worse rather than better. Amazingly that sentence doesn’t apply to the Broncos, but rather to Kansas City. I have to say, I was expecting more than what they’ve shown to this point. 32. Browns – …and this team is too inept to even know HOW to care. You're darn right I'm leading this story off with a photo of Left Guard Ben Hamilton. Why? Because offensive linemen rule, and they deserve their moment in the sun, that's why! 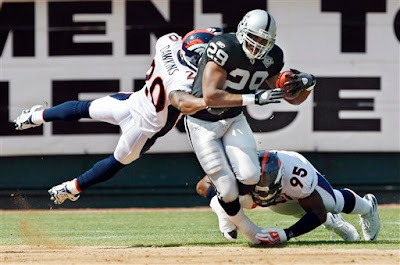 On the road in Oakland with an improving Raiders team, a Broncos team that had to feel fortunate to be 2-0 was going into what felt for the world like a game that would belong to the Silver and Black. So what happens? 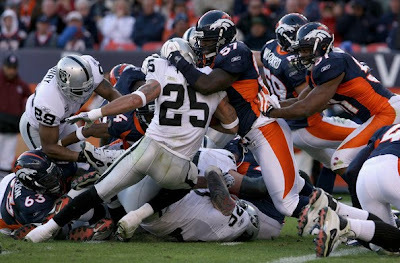 Naturally, the Broncos thump the Raiders 23-3 as Oakland continues their commitment to excrement. Through 3 games the defense has given up 16 points, that is not a misprint. 16 Points! It’s getting harder and harder to be skeptical of this Denver Broncos team. If my preseason prediction of a 4-12 record is to come true, they can only win one game in the remaining thirteen. I’ll never be more pleased to be wrong. I still refuse to get delusional about this team, as I think they will still finish under .500, but it’s nice that they have not looked nearly as poor as I was anticipating at the start of the season and things have gone about as good as I could have hoped or imagined. 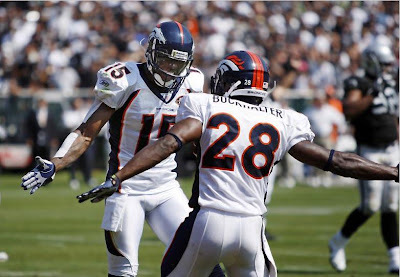 Brandon Marshall and Correll Buckhalter celebrate sitting all along atop the AFC West. That said, the difficult portion of the schedule is now set to commence, and we’re about to learn a whole lot about the Denver Broncos. Taking down the Bengals, Browns and Raiders is one thing…it will be much more impressive if they are able to do it to the Cowboys, Patriots, Chargers, Ravens and Steelers of the world. (Yes, those are the next five games, the NFL schedule maker is not kind to Denver.) 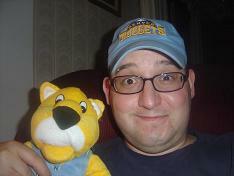 So I remain skeptical, yet hopeful, in light of the Broncos who are 3-0. As Ronald Reagan said of Russia during the Cold War, “Trust but Verify,” It’s been easy to trust in the Broncos so far, but these next five to ten games bring the point where we will need to verify. Although Russell's passes do look good, they tend to fly to players in the other color uniforms. For now, Sunday afternoon in Oakland was a bit of a cake walk. The Raiders are a poor football team, and despite some good talent in many places, the sum of the parts is less than the whole in Oaktown. If I’m the Raiders offensive coordinator, I don’t know if I ever call for a pass play of more than five yards past the line of scrimmage at this point. Jamarcus Russell is so bad that it is painful to watch him trying to pass downfield. His two early interceptions set the course for the day. They were both so badly overthrown, that I think the defensive backs could have called for a fair catch. Russell’s accuracy is troubling, or at least it would be troubling if I were a Raider fan. As an avid Raider hater, I find it more amusing, really. The odd thing is that he looks good back there, when he lets the pass go, he has an authority in the way he looks that really sells him as looking the part of an NFL quarterback. The ball zips out of his hands and down the field with zip, he has a massive arm that is impressive, the problem is he has a hard time getting the ball within twenty feet of his intended receiver, which is clearly an issue in the NFL. Odds are at least 50-50 that Kyle is throwing the ball away, but somehow it works for him. At times during Sunday’s game, the Raiders actually looked like a decent football team. As soon as the Broncos entered the red zone, their defense stiffened tremendously, and the Broncos could barely function offensively from inside the ten. 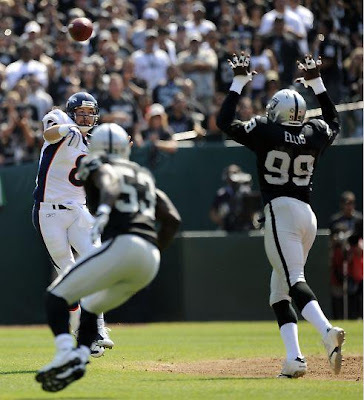 The problem for Oakland is that between the twenties, the Broncos had zero difficulties moving the ball. Kyle Orton may throw the ball away more than any quarterback I can ever remember, but he has to this point in the season made consistently good decisions, as evidenced by the fact that he is yet to throw a pick. I’ll take a smart QB who doesn’t try to force things to happen that are not there, I’m definitely coming around on Kyle Orton. Elvis Dumerville continues to enjoy introducing himself to opposing quarterbacks. He now has 6 sacks in 3 games, which is not too shabby. 1. Elvis Dumerville – The man continues to play like the world owes him an apology, and I love it. 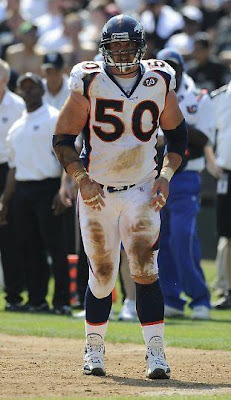 Ordinarily I am not a huge fan of the 3-4 defense, but it seems to suit the Broncos personnel to perfection. Elvis coming from the outside linebacker position is a stroke of genius, and let’s just say I’m a big Mike Nolan fan as defensive coordinator for this team. The results don’t lie, even if they have faced subpar competition to this point, giving up only 16 points in 3 games is solid work by the defense. Brian Dawkins likes to throw his body around, he's playing some solid ball. 2. Brian Dawkins – Early returns of this free agent pickup from Philadelphia are encouraging. I was worried he might not have enough left in the tank, but he has been flying around the secondary and laying wood to any offensive player who dares enter his area, not only that but the heads up play on the fumble in the 3rd quarter where he reestablished himself in the field of play before picking up the ball showed some serious football smarts. I love it when you have a guy in the secondary who is both a leader and an intelligent football player. The Broncos missed that last season with the retirement of John Lynch, and it’s nice to have it again back there. I’m enjoying the Dawkins era to this point. 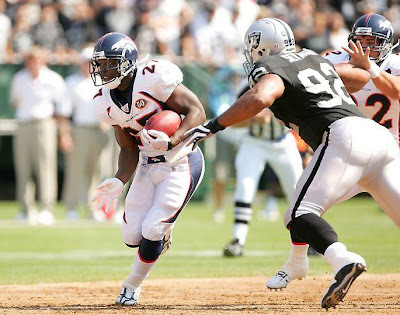 Knowshon Moreno is starting to show why the Broncos decided to draft him so high. You can take Brandon's picture off of the milk cartons, he was found in Oakland on Sunday. 4. Brandon Marshall - That's right, there was a bonafide sighting of #15 this weekend. He scored the first touchdown, and showed glimpses of the overpowering receiver he was last season. So that's something! 1. 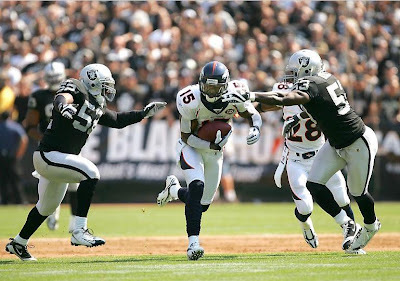 The running defense: At times the Broncos run D was shredded by the likes of Michael Bush and Darren McFadden. 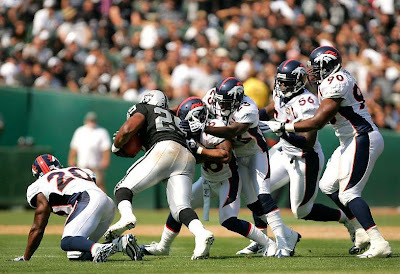 The Raiders fell too far behind to grind it out, but if the Broncos face a team that takes a lead on them in the future, it could be scary trying to get the opposition off of the field if they are able to run it down our throats like the Raiders did at stretches on Sunday. That area of the defense scares me a bit, and I think in the upcoming weeks we will see teams take advantage of it. The Raiders running game was the only thing that showed even brief glimmers of life. 2. The offense in the Red Zone: The Broncos should have had a lot more points on the board on Sunday than just 23, but they seem unable to smash it in once they get close. I hope McDaniels is the offensive genius he was advertised to be, and he gets to work on shoring up that part of the Broncos attack, as it stuck out like a red clown nose on Michelangelo's David on Sunday. 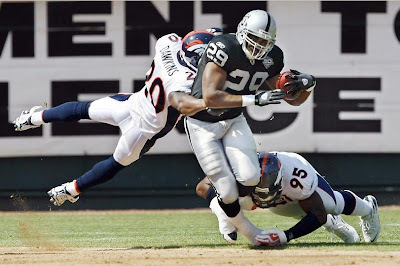 Again this week, there is little to criticize without sounding like you are nitpicking, so I'll stop there, as the Broncos looked pretty impressive against the Raiders. Just lose, baby. Redskins 10 Lions 9 - This game is easily the winner of the game I least want to see this weekend award. Although I'm picking against the Lions, I think they have a great chance of ending their losing skid and finally winning a game for the first time since 2007. Packers 33 Rams 10 - I'm feeling less enthusiastic about the Pack than I was at the beginning of the year when I picked them to win it all, but they should definitely have enough to take down the Rams and do so in convincing fashion. Vikings 22 49ers 17 - Suddenly this is one of the best games of the weekend. I have yet to see the Niners play a regular season game, but from all accounts they are doing well. I think AP and company will be able to eek this one out, though. Falcons 27 Patriots 17 - I think the Falcons are pretty darn good, and I think the Pats have slipped a bit. I also hope this is the case, because I dig the dirty birds, and lets just say New England isn't one of my favorites. Tom Brady looks a little tentative about his knee, and I think it's hurting the team. Jets 19 Titans 13 - A strong defense and a good start by Mark Sanchez have the J-E-T-S pointed in the direction of a much stronger season than I expected, and the Titans seem to be a bit snake bit thus far. Still, this should be a pretty good game. Eagles 33 Chiefs 3 - Even without Donovan McNabb, the Eagles seem destined to destroy the Chiefs. Kansas City is just not very good, and it could start getting ugly soon for the boys from KC. Giants 28 Buccaneers 9 - There are some good matchups this weekend, however this is not one of them. Are the Bucs the least interesting team in the NFL right now? Possibly so, I say. G-men in a walk, says I.
Ravens 38 Browns 0 - Let's just say I feel pretty confident in the Ravens ability to take down the Browns. They are my suicide pick for the week, the Ravens look strong right now, and the Browns just got pounded 27-6 by the Broncos. I'm not smelling an upset here. 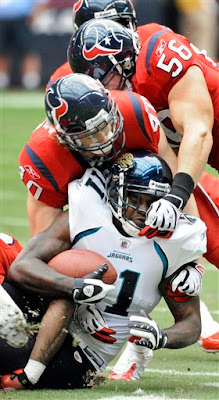 Texans 16 Jaguars 13 - I have a feeling that the Jags are going to be the masters of keeping it close yet losing all the time this season. The Texans are poised for a letdown after a gigantic win against the Titans last week, but I feel like they get a scare, but don't get a L.
Seahawks 24 Bears 23 - I'll go out on a limb here, since hardly anyone is taking Seattle in this one. Saints 40 Bills 27 - The Saints defense is average, but their offense is scary good right now. Steelers 17 Bengals 13 - The Bengals are better than I thought, but they are still the Bengals, and Pittsburgh is still Pittsburgh. Chargers 29 Dolphins 13 - The Dolphins are a decent team, but if they have to come back in the final 2 minutes, forget about it. Cardinals 27 Colts 19 - The Colts need to establish the run, and also establish that they can stop the run. Cowboys 24 Panthers 22 - Jake gets closer to a decent game, but not close enough to win. It's amazing how easy it is to take photos of people on a train without them ever knowing. 1. Saints – This may look crazy since the Saints defense leaves much to be desired, but Drew Brees has the look of a cold blooded killer, that offense is just relentless, and right now they are playing on the offensive side of the ball better than anyone else in football is doing anything else, so they get the number one spot for now. 2. Ravens – The defense isn’t demolishing people like they did a year ago, but Joe Flacco and the offense are on the rise and they are still solid defensively. Giving up 24 points to the Chiefs in week one is a little disconcerting, but they are still looking good enough to claim top billing in the AFC for now. 4. Jets – Color me surprised that Rex Ryan has Mark Sanchez and the Jets playing this solidly already. The defense looks really good, and Sanchez looks to be following in the successful rookie quarterback footsteps of Joe Flacco and Matt Ryan. 5. Vikings – Adrian Peterson is more the reason that the Vikes look scary to me than the 40 year old Quarterback. Brett Favre appears to be playing the role of game manager, a role that I’m pretty sure Sage or Tarvaris Jackson could have pulled off just as well. I’m curious how much money I could have made in Vegas betting that we would be heading into Week 3 and Favre would still not have tossed a pick, that fact has to rank up there in the more unexpected developments of the season thus far. 6. 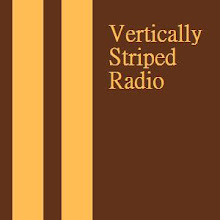 Steelers – The Champs could be 2-0 if Jeff Reed is able to knock in a short field goal on one of the two chances he had, but since he didn’t Pittsburgh is at 1-1 and facing some serious questions about the viability of their pathetic offensive line. 7. Chargers – They fell just short at home against the Ravens, but there are a lot of good signs…especially if you’re like me and you have Darren Sproles on one of your fantasy teams. You can stick a fork in Ladainian, because he is DONE! The Chargers are fortunate that the Raiders are the Raiders, or they might be 0-2 at the moment. 8. Packers – I’m feeling less thrilled about my preseason pick of the Packers winning it all after somehow the Bengals were able to walk into the not quite yet frozen tundra and put the Pack away. 9. Cowboys – Tony Romo needs to stop throwing game changing interceptions and the Cowboys will be okay. That may be easier said than done, but I still believe that Romo brings more to the table than he takes off of it. The Cowboys need to show me something if they want to stay this high, because right now they are trending down in my book. 10. Patriots – I have them this high due to habit of having New England in the top 10, but I honestly think that a combination of age, losing talented players, and having Brady only a year removed from a tragic knee injury has the Patriots in a weaker condition than people yet realize. The Pats are like Tiger Woods; they both used to be unstoppable forces, and while both are still very good neither are currently carrying that same air of invincibility. 11. Falcons – Matty Ice appears to have avoided the sophomore slump thus far, but it is still very early. So far the Falcons are looking like last year was not a fluke. 12. 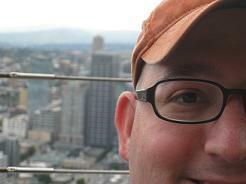 49ers – I had to do a double take after I typed it, but yes, I do have the Niners this high. I’m not sure how they are doing it with the immortal Shaun Hill behind center, but San Francisco is relevant right now…who knew?? 13. Eagles – Losing McNabb hurts the Eagles, but you’d think they’d be used to it by now. If he can get back soon, I like the Eagles chances to rise back up this list, but for now, they have fallen to unlucky thirteen after getting drubbed by the Saints. 14. Colts – Perhaps it was the curse of having me pick them to make the Super Bowl, but the Colts look very ordinary right now. That said, when Peyton Manning is in crunch time, he still gives off the impression that there is just no way that he fails. As he was driving late in the Monday Night game, was there any doubt he was going to lead the offense to the go ahead score? Not in my mind. 15. Texans – I was shocked at how badly they were beaten on opening day, but now that the Jets are looking like a serious contender, it is a little less surprising. I still believe in Matt Schaub and Andre Johnson, and I’m hoping on Steve Slaton since he is a vital part of my fantasy team. Going into Tennessee to take down the Titans in a game that was a close to a must win as you can get in week 2 was a good sign. 16. Titans – This team appears to have lost it’s mojo. That’s practically inconceivable with the immortal Kerry Collins at quarterback. I’m at a loss. 17. Bears – Jay Cutler is not a highly likable fellow, but he is a better quarterback than the media have been painting him out to be since the stink bomb of a game he played on opening night. I don’t think I like the Bears to make the playoffs, but I don’t think it will be all Cutler’s fault. 18. Cardinals – Arizona looks to be back to their inconsistent ways which defined them for so much of last season before they went on an improbable tear in the playoffs. They aren’t terrible, but they are not as good as the team that was one defensive stop away from a Lombardi Trophy back in February. 19. Bengals – This team is a fluke touchdown away from being undefeated so far. Going into Green Bay and taking down the Packers is impressive, and better days may finally be ahead for the men in tiger stripes. 20. Seahawks – Hopefully for the Seahawks sake Matt Hasselbeck is not out for too long with his rib injury, the backup situation with Seneca Wallace and something called Mike Teel is none too strong. 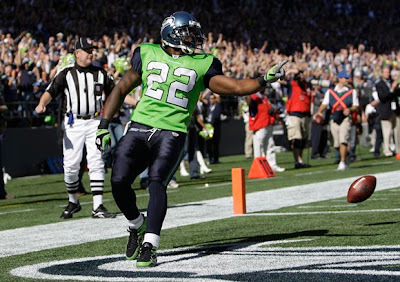 You would have thought the Seahawks got all their bad injury karma worked out of their system last year, wouldn’t you? 21. Panthers – I have a hard time believing that this team dropped this far this fast. This was the team I was predicting to win it all at the tail end of last season, and now with the horrific play of Jake “the H is silent” Delhomme, they look like they have the potential to lose to anyone. 22. Bills – The Bills may be able to string together a decent season, and they haven’t looked half bad so far with a close loss to the Patriots and a good win over a poor Buccaneers team. 23. 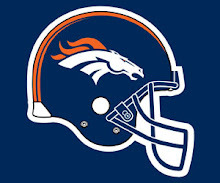 Broncos – Yup, this feels about right for my boys. I want to be excited about being 2-0, but I keep looking at the upcoming schedule for them which makes me sick to my stomach. After the Raiders game this weekend, they face a stretch of Cowboys, Patriots, Chargers, Ravens, Steelers, Redskins. Chargers again, and then Giants. I don’t see a win in that group, plus they then have to go to their personal house of horrors at Arrowhead where even bad Chiefs teams usually beat them and then a game at the Colts. It’s not hard to imagine that they lose 10 games in a row, so while I’m upbeat about the undefeated run through the teams of Ohio, I’m nervous about what lies ahead. 24. Dolphins – This is a solid, if unspectacular team. Their lack of playmakers on offense is stunning, as once they fell behind late in the game Monday night, there was just no way they were going to win. I haven’t seen that kind of urgency in a two minute drill since the Eagles in Super Bowl XXXIX. Seriously though with that Colts game, how do you hold an advantage in time of possession by 45:07 to 14:53 and lose a game? I would not have thought it possible. 25. Redskins – I just have a feeling that the Redskins are just not that good. Barely having enough to put away the Rams at your home stadium is embarrassing, plus they face a similar dilemma as the Lions in that the rest of their division is significantly better than they are. 26. 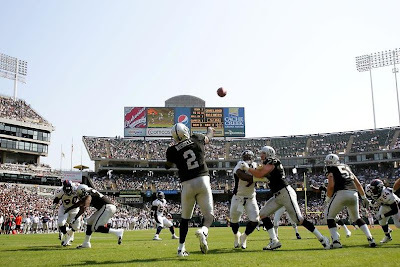 Raiders – This may be a different Raiders team than we have seen over the past several years. They look legitimately frisky right now, and I’d probably have them even higher if they had a quarterback who was even remotely credible behind center. Jamarcus Russell is just not a legit NFL QB. 27. Jaguars – They hung with the Colts, but they always seem to just barely lose to the Colts. The bigger worry is how they were run off of their own field by the Cardinals. This team is just not very good. 28. Buccaneers – When you quarterback choices are Byron Leftwich or a rookie project from Kansas State, you are not starting out ahead of the game. I feel for Raheem Morris who is going to have a tough rookie season as a head coach down in Tampa. 29. Chiefs – When you hold a visiting quarterback to only 109 yards passing and he only completes seven passes all day and you STILL lose, you are a crappy team. The Chiefs are crappy. Perhaps they get better, but Kansas City is far from scary right now. 30. Rams – The Rams decided to actually score some points this week. Granted they only have 7 points all season to this point, but at least they are on the board finally after week 2. In Saint Louis, it’s the little things you have to find victories in, because you’ll find precious few W’s on the scoreboard this season. 32. Browns – This team looks absolutely atrocious right now. They came into Denver and put up a fight for about a half, but then they looked like a team looking for a soft place to land. Ever since the Browns returned from exile earlier this decade they have not had a whole lot to be proud of in Cleveland regarding their football team. It looks like that trend is continuing this season.